Kilmacteige is a Parish in Ireland’s Northwest Province of Connacht. 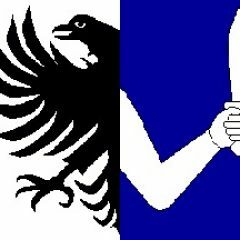 The Flag is the Eagle and Sword (below) and formally described as “… a dimidiated (divided in half from top to bottom) eagle and armed hand. The arms are recorded as such on a map of Galway dated 1651, now in the library of Trinity College, Dublin….”. Interestingly, These arms VERY closely resemble those of the Schottenkloster or (Scots) Irish monastery founded in Regensburg, Bavaria, in the 11th century. 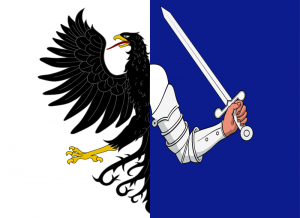 However, it is unclear how the arms of the Schottenkloster — as it is located deep in the heart of the Holy Roman Empire — came to be associated with the province of Connacht in Ireland. It is something in need of research ! The province of Connacht has no official function for local government purposes, but it is an officially recognised subdivision of the Irish state. Kilmacteige is in County Sligo, in the Southern part of the County Sligo, in the NW of Ireland. The nearest the Village is Aclare. Close communities also include Tourlestrane (Sligo), Tubbercurry (Sligo), Killasser (Mayo), Swinford (Mayo), Ballina (Mayo) and Foxford (Mayo). In South Sligo, the Townlands of Knockbrack and Stonepark are those that We started concentrating on research . These communities are on the slopes of the Ox Mountains (Sliabh Gamh, in Irish), and also known as “St. Patrick’s Mountains” as the Saint is reputed to having built several Churches in the area, and some of the Named Wells there, or by St. Patrick’s contemporaries. The “Holy Mountain” Crough Patrick is in Mayo — the Curlews some miles South of Sligo –. The Highest Peak in the Ox Mountains is Knockalongy (544 meters, or 1785 feet) and the range runs about forty miles from Ballysadare, ending near adjoining County Mayo. The Great Hunger, or the Irish Potato Famine (“An Gorta Mor” happened roughly from 1845-52) and it decimated the Population in Ireland, particularly the Northwest of Ireland through Starvation, Emigration, and Evictions. The Irish Population, from close to Eight (8) Million in the early 1840, went down to almost half that (4.5 million) in the mid 1850s. There is no list or “accounting” of the deaths vs. emigrations as the Administrators of Ireland, in their own Words, simply did not care how many died, they considered it not their Concern !! Today (2017) the Population has still not recovered. Even today relics and ruins from the Famine times are commonly seen by visitors – as are ringforts dolmens from Thousands (1000s) of years ago, some built well before the Pyramids in Egypt were built, so the People have inhabited the area for a long time. Sadly, most written records are from the 1800s forward (but many older records exist so knowing Irish History is important if doing research on your Ancestors from Sligo). Sligo’s History is likewise interesting and long. KILMACTEIGE.COM attempts to copy, or acquire (or link) ALL AVAILABLE Records for the Parish population back to, well, as far back as possible (below you find a map from 1685 for Kilmacteige Parish and the Ox Mountain area). This would include (but not limited to) Church Records, Civil Recprds, Land (Ownership, Rentals or Cotters, and Leases (sometimes Leases were for “Two Lives” explained on other pages), Real Estate sales records (land registry records) which sometimes are good sources of information), as well as Gravestones in the two (2) main Kilmacteige Cemeteries – and Baptism, Marriage, and Death (BMD) records – and any others as rental records are being recovered presently. If you would like to send a comment(s) please use the form below.